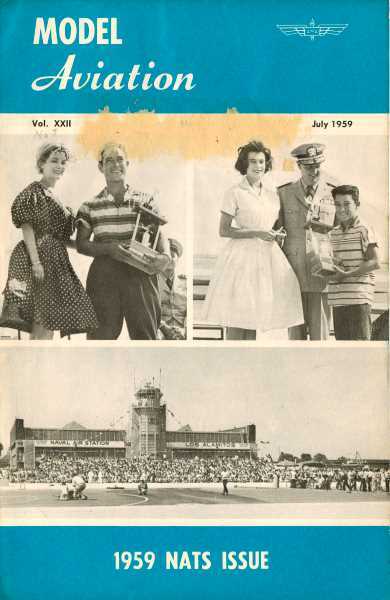 Here is a report on the 1959 Nats, aka the 28th National Model Airplane Championships, held at Los Alamitos Naval Air Station, California. For those not familiar with the early Nats, the U.S. Navy used to sponsor and host the entire show primarily because it was considered a good recruitment tool for young men of a necessarily competitive nature. Their hopes were that those guys would see really cool stuff at the base and anxiously anticipate the day when they could join. Some time in the late 1960s, the attendance by youngsters was so low that the Navy decided to pull its support. Bill Winter managed to talk them into staying for a few more years after promising to work to bring youth participation back up, but, alas, it did not last. 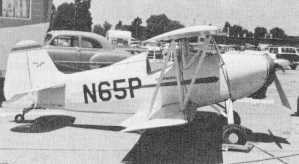 We understand that Navy Recruiters made a beeline for Frank Pisz of Union, N. J., right after he greased his Sky raider onto the deck of the CVM FLYING ESQUIRE. Although ship placed fourth, landing was one of the best seen. 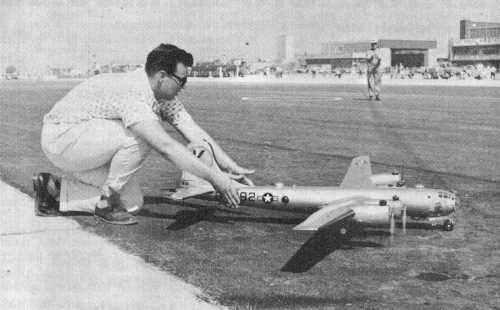 The most important meet of the year - the 28th National Model Airplane Championships, held this year at Los Alamitos Naval Air Station, California - has closed another chapter in the long history of Model Aviation. The Navy again acted as host for the 12th consecutive time, for what can be described as the most successful Nationals ever held on the West Coast, in terms of both organizational efficiency and number of contestants. The fact that the whole operation ran so smoothly can be attributed not only to the goodwill of the Navy for providing facilities and personnel, but also to Contest Manager Keith Story and his team of helpers, whose untiring efforts before and during the seven-day Championships, are worthy of the highest praise. In addition, the required advance registration instituted experimentally last year, again proved that this method is the only way to adequately prepare for a meet of Nationals magnitude. This superbly detailed Focke-Wulf FW-190 carried off both the Open Control line Flying Scale Trophy and the Testor Corp. best finish award for its builder, Bill Ogden of E. St. Louis, Ill.
Robert Greetham, an Air Force man from Norton AFB, built this detailed model of a Fokker E.3. Plagued with elevator troubles, ship did not place in FFFS. Two unidentified modelers prepare their model for flight in the R/C Multi event at this years Nationals. Large model or full-size job? Of course it's a full size aircraft, built at home in his spare time by Paul White of Riverside, Calif. Known as the Smith DSA-1 (Darned Small Airplane) Miniplane, craft measures 16 ft. from wing to tip to wing tip. Contrary to all reports, the DSA-1 is powered with a 65 hp Continental and not with a McCoy 60 as has been rumored. 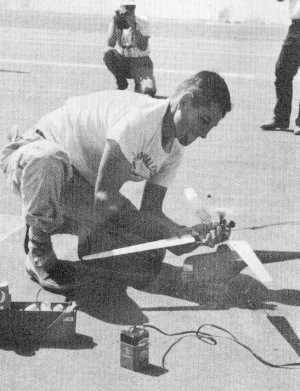 Well-known model whirlybird man Parnell Schoenky, prepares his craft for flight in the Helicopter event. Ship won the event with total of 88.5 points. Howard Timlin, San Antonio, Tex. shown after retrieving his FAI Power model which won Open event with a time of 19:29.0. Oliver Tiger diesel provided power. Ed Childress of Castro Valley, Calif. braces himself as he prepares to take over control of his monster B-29. Craft placed second in CLFS event. Unusual twin-boom .020 Clipper Cargo model by Walt Mooney flew well, but stiff breeze affected its performance considerably. 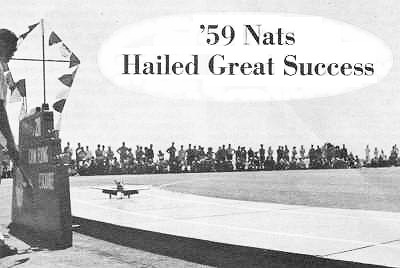 Blessed with near-perfect weather, except for the slightly stiff breeze which prevailed throughout the week, the 1959 Nationals attracted no less than 976 contestants from all corners of the United States, Canada and Mexico. Although by no means the largest Nats ever held, due mainly to the geographical location of the meet, the number of contestants present this year, did surpass that of the last California-held Nats four years ago, by something like 200 contestants, which certainly gives a good indication of the increased amount of interest being shown in competitive modeling, especially in the younger age group. From the very beginning of the first day's activities, it became apparent that a very high standard of flying was to be expected. This became more evident later in the week when National records were being shattered at a fast rate. The final tally at the end of the week (now confirmed) showed 25 new National records. A combination of good fortune and excellent modeling added a new twist to this year's Nationals. For the first time in the history of the National Model Airplane Championships, a father and son - Bob and Bill Hunter (Cover Photos) - walked off with the Open and Junior National Championship awards respectively. The Senior National Champion for 1959 was Sherwin Maslowe of Detroit, Mich. The Lakewood (Ohio) Flitemasters captured the Team Championship award with a total of 2,877 points, beating their nearest rivals, the Air Force No. 1 Team, by a substantial margin of 367 points. As in previous years, special awards were donated for high point winners. The Testor award for best finish was awarded to Bill Ogden for his fine control line scale model of a Focke-Wulf FW-190. The Harvey S. "Pop" Robbers Memorial Trophy, awarded annually to the high point winner, regardless of age, in the Navy Carrier event, was won by Garry Korpi, Concord, Calif. The FAST Team Trophy was presented to combined age group Team Race winner, Eugene Leedy, Torrance, Calif., while the Tulsa Glue Dobbers Towline Glider Trophy for high time winner, regardless of age, in either Nordic A-1 or A-2 went to Warren Kurth, Blooming­ton, Ill. A complete listing of other special awards can be found further on in this issue. It was unfortunate that the indoor events did not attract a larger number of contestants, due largely to the fact that during the planning stage of the Nationals, AMA was unable to secure the use of the Santa Ana hangars. What followed was even worse. The entry blanks stated that the indoor events were to be held in the Long Beach Auditorium and the height of the ceiling was shown as 40 ft. This was later corrected to read 70 ft. However, the damage was done and from the letters received at Headquarters, it was obvious that many would-be contestants felt that they could not justify a long trip to the Nationals to compete in such a small area. At the last minute, word was received that the Santa Ana hangars were to be made available after all. Every indoor contestant was notified by postal card and a note was inserted in MA, which unfortunately did not reach the majority of members in time. In spite of this confused situation, a fair number competed in the indoor events and some good performances were noted, though not quite good enough to shatter existing National records. 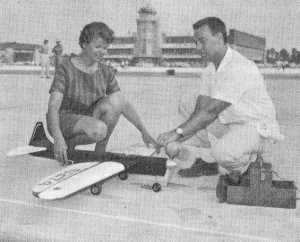 For those of you who have not had the opportunity to witness flights of these extremely frail paper-covered and microfilm models, we can tell you that this is one of the most unusual and fascinating events of all the free flight categories. The outdoor events again proved to be the most popular, judging by the number of contestants. 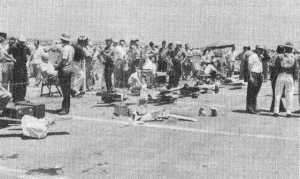 A count of the individual flight cards has revealed that the three top contestant drawers were: 1/2A Free Flight Gas - 358 entries; Class A Free Flight Gas - 307 entries; Outdoor Hand Launch Glider - 275 entries. These totals include Junior, Senior and Open contestants. The Radio Control events appear to attract more contestants each year, and this year was no exception. It was felt that the special elimination procedures pioneered last year, contributed greatly to the increased number of contestants this year. These events were a joy to watch as many of the country's leading R/C modelers battled their way through the eliminations to the finals. In view of the high standard of flying, we know that the judges had a very difficult time selecting the winners from so many experts. 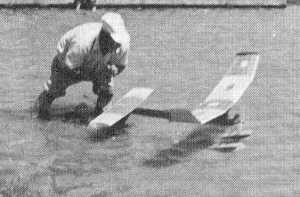 Probably the most fascinating part of the R/C events was the Pylon races. It was almost uncanny to see these models race down the runway - sometimes just a few feet off the ground, at high speed, and then bank vertically around the pylon in a tight 1800 turn, under full control. In the PAA events, the wind caused quite a bit of consternation at times, but on the whole, most of the models behaved quite well. For many PAA enthusiasts, the Nationals created the last opportunity for them to fly .049 Clipper Cargo models competitively, as this event has officially given way to the lower-powered .020 class, which was also included in this year's calendar of events. Free Flight Scale attracted quite a number of contestants. 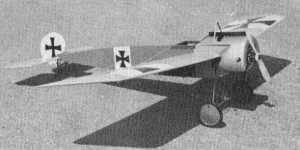 The standard of workmanship was remarkably good, but the flight characteristics in many cases left something to be desired. With but few exceptions, the majority of models appeared to experience the greatest difficulty during takeoff. Ground loops were all too common and if a ship did manage to become airborne, poor trimming invariably resulted in a collision between the model and mother earth. Control Line Flying Scale fared much better. Here again the standard of workmanship was excellent, but unlike the Free Flight Flying Scale, most of the models proved their ability to fly without too many problems. 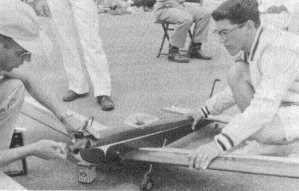 Ed Childress of the Castro Valley (Calif.) Flying Club deserves a mention at this point. Flying a beautifully finished B-29, Ed put all the single-engine contestants to shame on his first qualifying flight, when he succeeded in starting all four engines and becoming airborne within one minute. Phil Garrard of Costa Mesa, Calif., flying a twin-engine Grumman F7F-3 Tiger-cat, must have spent many long evenings working on his ship. 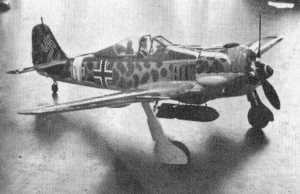 This Tiger-cat was equipped with retractable landing gear, brakes (which worked) and navigation lights, all battery operated. In addition, the ship was also equipped with low-speed engine controls and cut-out. Another very interesting contest was the Navy Carrier event. Always a crowd attracter, this event demanded more than ordinary skill to set a model down on the aft end of the deck. The workmanship of most models in this event, in general, was not very good. However, the quality of flying was superb which more than made up for the indifferent workmanship. In any case, carrier models take much more of a beating than any other class and those models entered, were certainly well-worn. All in all, everyone seems to have had a good time - winners and losers alike. Members of the press were kept extremely busy throughout the Nationals and it would be almost impossible to estimate just how many photos were taken. Dashing about the flying field in brightly colored Chryslers, De Sotos, Dodges and Plymouths, very kindly loaned for the occasion by the Chrysler Corporation, the press boys and Contest officials alike, were saved many weary hours of leg work. One sour note marked an otherwise spectacular Nationals, and that was the amount of thievery and sabotage which took place. From all reports, this sort of thing did not take on the proportions of previous years, but even so, this despicable display of bad sportsmanship by those responsible, is something which leaves a nasty taste in the mouths of the victims, and we only hope that they will not be deterred from attending future Nationals. 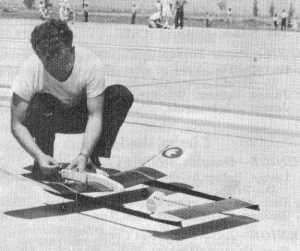 Gerald Chaney of Anaheim, Calif., prepares his Proto Speed model for flight. We don't know the identity of his lovely mechanic but Gerald sure looks pleased with both models! Seems like a good deal of Hangar flying is going on at the R/C pits while contestants await their turn to fly. 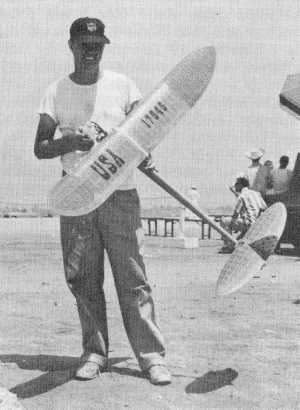 Howard Johnson of Los Angeles in characteristic pose, as he releases his ROW Free Flight model. Ship showed beautiful takeoff and flight characteristics.